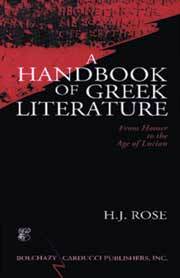 Rose's Handbook is a brief, accurate account of Greek literature in the light of modern knowledge. Like his A Handbook of Latin Literature, the book is a continuous narrative, complete in itself and assuming no previous acquaintance with Greek writings. It aims at including every author, from Homer to Lucian, who was Greek in both language and spirit. Rose is scholarly, thorough in presentation, and highly accessible in his text. A Handbook Of Greek Literature is the ideal introduction for students of Greek literature and the nonspecialist general reader to become acquainted with the basics of our Hellenic literary legacy.